When you hear 'vinyl siding styles', people are generally talking about the different profiles, textures, colors, profile, thicknesses, lengths and prices within each 'type' of siding. 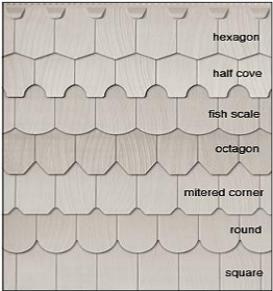 Each 'Type' of vinyl siding comes in many different colors, different textures from smooth to a rough cedar plank look. They come in different thicknesses and some have insulation attached to the back of the panel. Most people refer to styles and types interchangeably. Once you decide on the siding you like the contractor will know what you are talking about. Homeowners often use several different 'types' of siding to create the 'style' or look that they want. On the house above the homeowner has used Cedar Shake Vinyl Siding on the main house and Board and Batten vinyl siding on the garage gable. 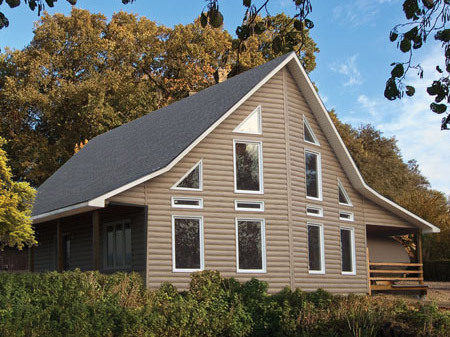 Very creative way to combine two different vinyl siding styles. 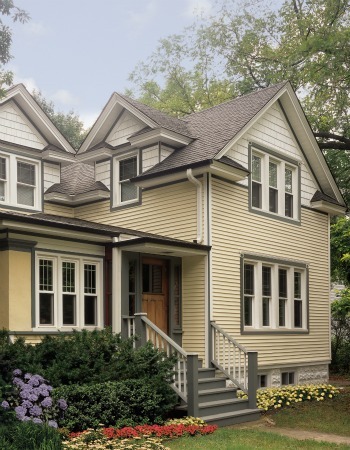 Here are the three most popular siding styles. Since vinyl siding is made to look just like real wood siding, every wooden siding now comes in a vinyl version. Looks like real wood but at half the cost! And almost maintenance free. Just hose it down once in a while with the garden hose. No more painting! Board and Batten or Vertical siding, runs up and down the house, vertically. It usually consists of wide boards with a smaller board or 'batten' used to seal the crack where the two wide boards meet. This makes it very weather tight and helps keep the harsh winter winds out. It has been used for hundreds of years and is still very popular. People have used cedar shake siding forever. Cedar is a rich, hardy wood with beautiful colors and hues. It withstands the weather better than most other woods. It has long been a prized home siding material. Vinyl cedar shake looks like real wood without the high cost and high maintenance associated with real wood. 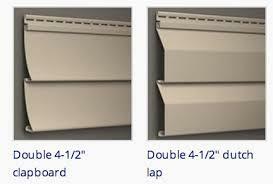 To see more information on the different 'Types' of siding and vinyl siding in particular, click here.. Vinyl Siding Types. Vinyl siding is made to mimic real wood siding, therefore any type or style of wooden siding will be available in a vinyl version. Homeowners often combine several different types and styles of siding to create a particular look. Here the homeowner has combined clapboard on the main house with vinyl cedar shake on the gables and white scallops for accent. Very good use of vinyl siding types mixed together to create a particular look. What is the difference between Styles and Types? 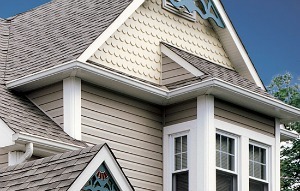 Vinyl siding 'styles' are the different profiles, colors and textures that each 'type' of siding has. For example, clapboard or horizontal type siding has three main styles; dutch lap, beaded and smooth. It also comes in different widths sometimes called profiles. Example, double 4", triple 3", etc..
Board and Batten or 'vertical siding', comes in different widths from 10" to 13"+ and runs vertically from top to bottom of the house. Cedar Shake comes in 'staggered' and 'straight edge', and textures that range from light grain to thick rough cut shakes. Just ask your contractor about the many different products available. Houses are all different!! They come in all shapes and styles. 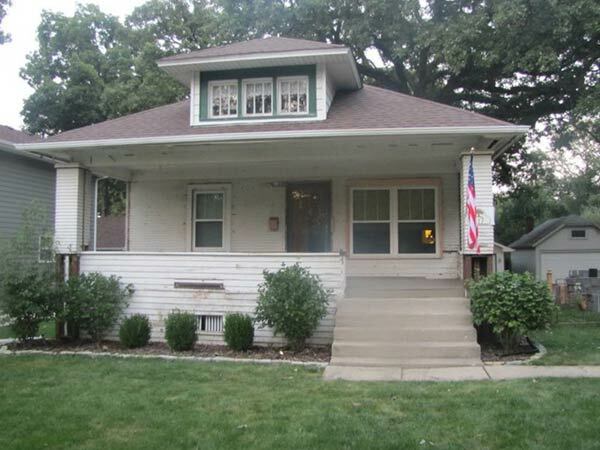 Houses have different 'styles', some houses just look better with particular 'types/styles' of siding. The key to a beautiful home is to pick the right type and style of siding that adds new life to the house. You want to first determine what 'style' house you have. Then drive around and find other homes like yours and see what you like about each one, and what you don't like. Make notes, and take plenty of pictures on your cell phone. 'Vinyl siding styles' and 'vinyl siding types' are generally used together, interchangeably by most people. When you talk to a contractor he will know the difference and and he will know what you are talking about. 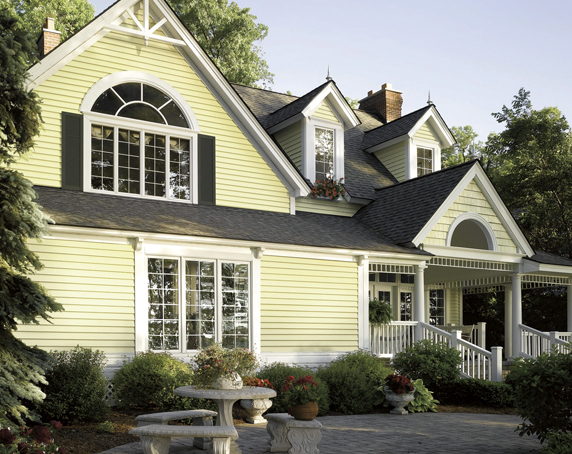 Within each 'type' of vinyl siding are many different styles, profiles, thickness, lengths, finishes, colors and prices. The thickness of the siding generally defines the quality of the vinyl siding. 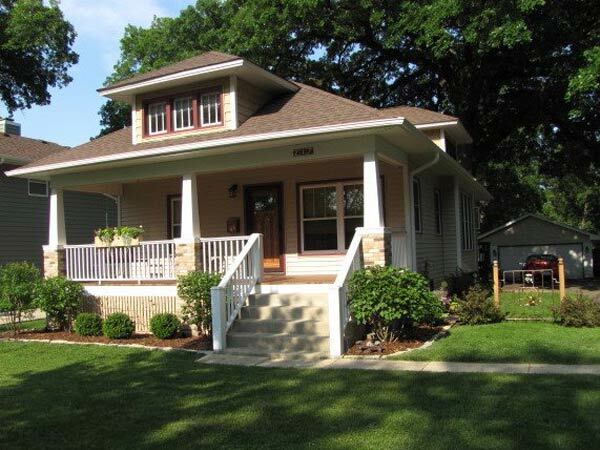 Horizontal Siding Styles. 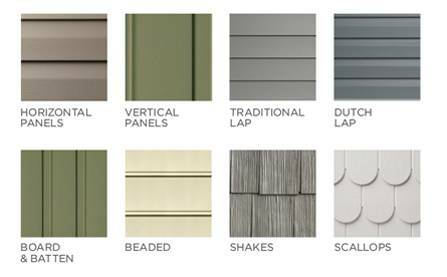 Often called traditional lap siding, clapboard siding, dutch lap siding, beaded siding and ship lap siding. The reason that vinyl siding is so popular is that it can be used on almost any house to enhance the beauty and charm of the home. 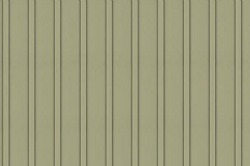 Vinyl Siding is Green siding. 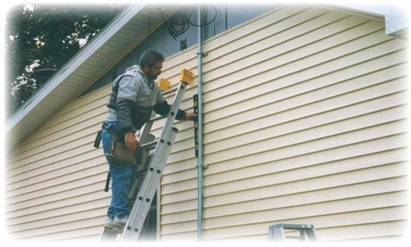 Clapboard siding is sometimes referred to as horizontal or lap siding. It is siding that runs across the house, horizontally. Which is more popular? Dutch Lap or Clapboard Siding? 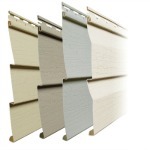 Dutch Lap and Smooth Lap are two of the most poplar vinyl siding styles in the clapboard family. The difference is the grove on the top edge (dutch-lap) and one smooth with no grove (clapboard). 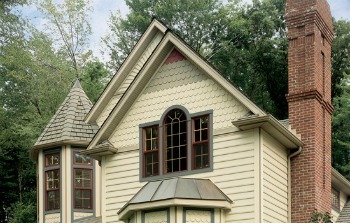 Dutch lap is a very popular style of clapboard siding. It has been used on homes here in the U.S. since colonial types. It has a very distinct curved notch that runs along the top edge of the panel or board. 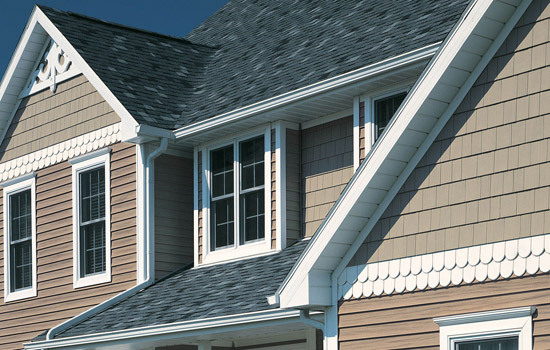 Dutch Lap style siding has a hand-cut notch on the top edge of the board giving it a distinguished shadow line well known since Colonial times. The vinyl dutch lap siding looks like real hand-carved wooden planks. Early colonist actually hand-carved the notch into each wooden board to create the look. Note the shadow line on the top edge of the panels. This is what gives Dutch Lap the characteristic look of hand carved wooden planks. Early Colonist actually did hand carve the top edge of each wooden plank. This made the dutch lap a much more expensive siding because of the extra labor required to make it. Smooth Lap clapboard looks like long painted wooden planks. It is used for Restoration of older homes or to create the Colonial look. Note the smooth panels with no additional shadow lines. Looks like freshly painted wooded boards. Traditional clapboard type. Also referred to as 'traditional lap siding'. 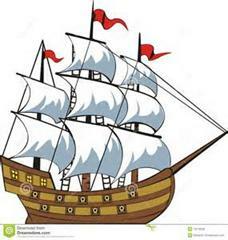 It also looks like the sides of old wooden sailing ships and because of this it is still referred to sometimes as 'ship-lap' siding. Beaded clapboard siding has a bead on the bottom edge of the siding. This was hand carved in olden days creating a unique and sophisticated look. Note the shadow ling along the bottom edge. In early America, colonist would hand carve this notch along the bottom edge. This made it cost more. It was a top end product back then used by the more wealthy. It was considered very sophisticated. It is still used today to give that early American look to homes. Log style vinyl siding allows the homeowner to have the rugged outdoor look of a log home without all the cost, up-keep and maintenance of real wooden logs. Vinyl log siding offers that outdoor ruggedly charming look without the high cost and high maintenance of real cedar log construction. To see more information about vinyl log siding click here. 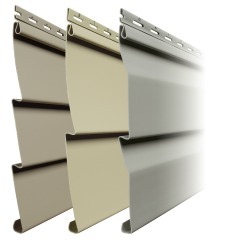 Kaycan manufactures high quality vinyl siding in many different styles. Here are some of their more popular styles. Each style comes in smooth texture or cedar grain textures. 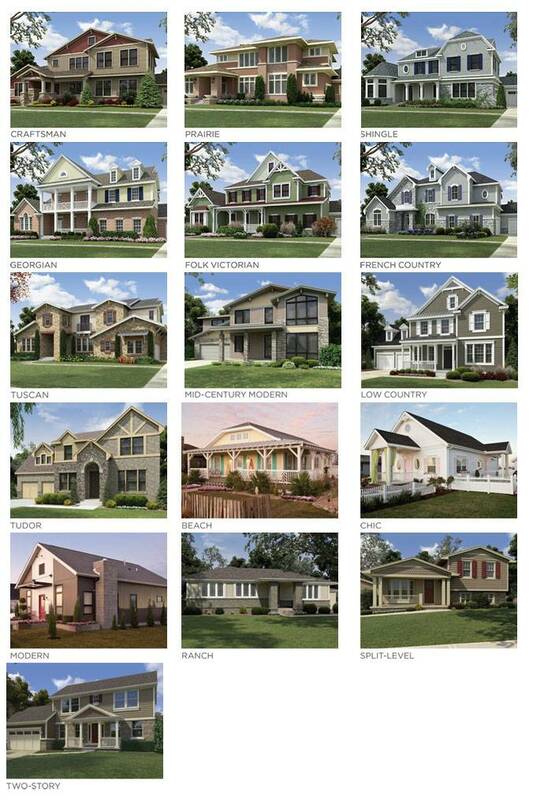 To see more Kaycan vinyl siding styles click here. Vinyl is not the only siding that looks like real wood. There are other types of man made siding such as Hardie Board, Cement Board, Fiber Cement Board and Engineered Board. 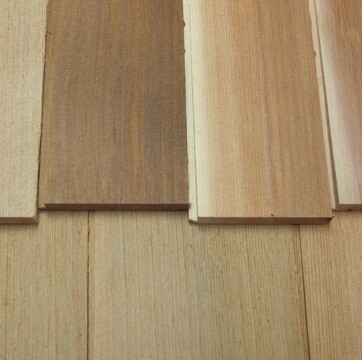 There are many different wood like siding available now. Hardie Board is one of the most popular sidings, looks like wood but stronger. 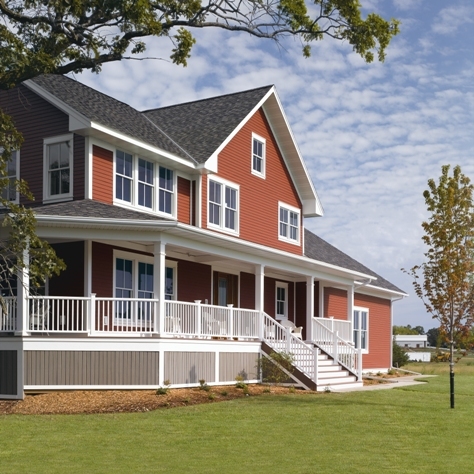 Click here to see more information on Hardie Board Siding. Cement Board Siding or Concrete Siding is available in Cedar look, most Clapboard styles, both in Wood Textured or Smooth finish. 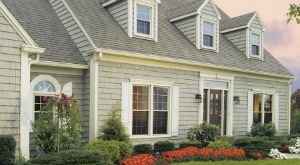 Shown here is Certainteed WeatherBoards Fiber Cement Lap Siding in Redwood Color. 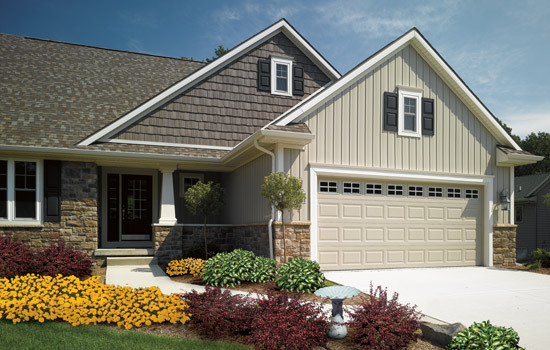 Fiber Cement Board Siding is an alternative to vinyl siding. It is more expensive than vinyl siding but had superior weathering characteristics. Strong, durable and impervious to wood-boring insects, resists UV rays and moisture. It comes in all the most popular styles and colors. Excellent for use in harsh weather areas such as around coast lines. Engineered wood siding is made from wood fibers and resins to create a very strong, durable wood look alike that resists rot, mold, and insects. Comes in many factory painted finishes or pre-primed. Can be painted any color. Is much stronger than vinyl siding but still costs less than real wood without all the high maintenance of real wood siding. 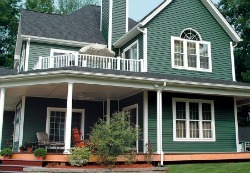 Click here to see more on Engineered wood siding. 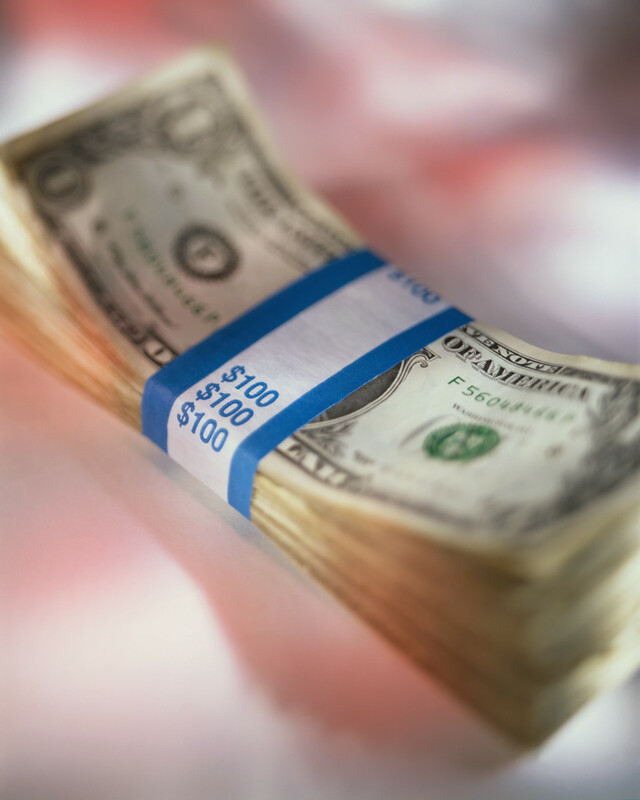 Siding cost and siding prices are two very different things! not the total cost of installing the siding on your house. Click here to review all the costs involved in installing siding on your house. 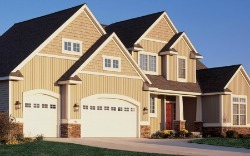 Vinyl siding comes in almost unlimited colors. Each year new colors come out. From earth tones to pastels and everything in between. Many people mix and match different colors and styles to create that perfect look. 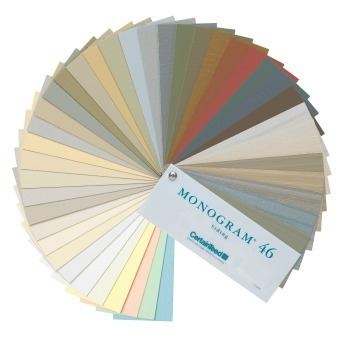 Click here to review some of the different colors selections. 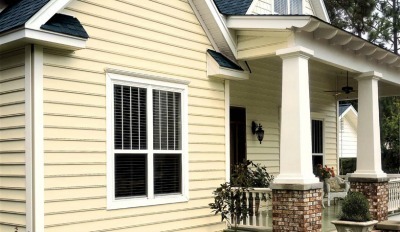 You can mix and match different vinyl siding styles together to create many different looks. Many people combine at least two different types of siding to break up different sections of the house or as trim to accent particular areas of the house. Cedar Shake and Half-Rounds are used as trim to separate different sections of the home. Half-rounds have been used as trim or accent for centuries. It adds a special touch of style to any home. Half-rounds come in many different shapes and patterns. 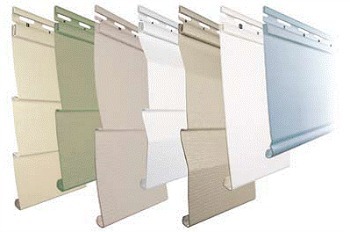 As you can see there are many different vinyl siding styles to choose from. Lots of people use several different types of vinyl siding to customize their home. Mixing and matching different sidings allows you to completely personalize your home. To see more pictures of homes using vinyl siding click here.